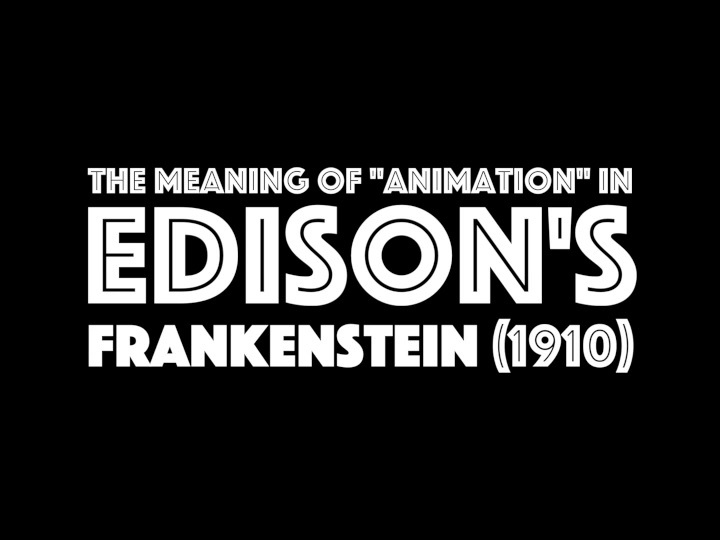 “The Meaning of ‘Animation’ in Edison’s Frankenstein” considers whether the cinema is itself, in a certain sense, a Frankensteinian technology. Like Frankenstein selecting parts from corpses and infusing life into a composite body, filmmakers utilize the technical means of film to (re)animate the “dead” (or photographically preserved) traces of living organisms (e.g. actors) into new visual narrative compositions. In his discussion of Frankenstein films, William Nestrick writes: “The film is the animation of the machine, a continuous life created by the persistence of vision in combination with a machine casting light through individual photographs flashed separately upon the screen. Since ‘life’ in film is movement, the word that bridges the worlds of film and man is ‘animation’ – the basic principle by which motion is imparted to the picture” (294-95). It will be objected, however, that this invitingly simple analogy is too general in its scope; it overlooks historically specific transformations in the way such “animation” has been staged. Luckily, the long history of Frankenstein adaptations amply documents such changes and makes up for the missing nuance. 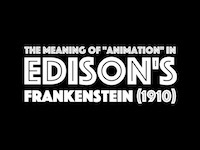 As the foregoing description indicates, Edison’s Frankenstein finds itself now at the crossroads of a media-historical transition the likes of which has rarely been experienced so widely and so rapidly: namely, the transition from analog to computational media, and in particular the shift from cinematic to post-cinematic media. (On the notion of “post-cinema,” see the open-access collection Post-Cinema: Theorizing 21st-Century Film, edited by Shane Denson and Julia Leyda.) However, this transitionality of Edison’s Frankenstein is not new, and it is not specific to the accidents of its proliferation in digital networks a century after its production. Rather, the film was already caught in the midst of a significant media-technical and cultural transformation in 1910, one that concerned the cinema’s own reorientation from an early, image-technology oriented “cinema of attractions” (as Tom Gunning has famously termed it) to the coming narrative-oriented classical Hollywood style that would take shape around 1917. In 1910, the medium was in transition, torn between lowbrow technological spectacle and an uncertain reorientation along the lines of the respectable theater. Accordingly, advertising for the film emphasized both the “photographic marvel” of the creation sequence as well as the story’s origin in “Mrs. Shelley’s […] work of art.” The film aimed to be both visual and technological spectacle and narrative high culture. And this multiple address relates directly to the uncertain significance of “animation” at this historical juncture. The “annotation essay” exhibited here uses onscreen text superimposed onto the film (presented in its full, single-reel duration) in order to contextualize the film – and, more generally, to historicize the analogy by which film itself might be seen as a Frankensteinian technology of animation. Through a close reading of the creation sequence, whose so-called “marvel” consists of footage of a burning mannequin projected in reverse, and the final showdown between the creator and his creature, staged by way of cinematic trick effects involving a mirror that triangulates the viewer with respect to the screen and its changing models of spectatorship, the video essay shows the film to be a highly self-reflexive engagement with cinema and its transitional understanding of animation. Importantly, “animation” serves here to link the monster’s creation with the term “animated photography,” still common in 1910 as a description of film in general. Thus, when Frankenstein ultimately triumphs over the creature, he also figures the triumph of a new, proto-classical form of spectatorship over the older, “primitive” form of technological fascination with the medium. Significantly, the film’s staging of the conflict coincides with the historical differentiation of film, or “animated photography,” according to which animation in the narrower sense came to be distinguished from, and subordinated to, a more respectable form of live-action filmmaking that favored drama and characterization over novelty gags and trick-film effects. The monster, a literal product of animation, charts this differentiation at the same moment that people like Winsor McCay were popularizing techniques of animation in its narrower sense. Thus, the monster embodies the technology of the animated spectacle, and his marginalization reflexively indicates the framing function of animation in film and visual culture more generally, reminding us that live-action cinema is animation too, but in a normalized or naturalized form. Denson, Shane. Postnaturalism: Frankenstein, Film, and the Anthropotechnical Interface. Bielefeld: Transcript-Verlag/Columbia University Press, 2014. Denson, Shane, and Julia Leyda, eds. Post-Cinema: Theorizing 21st-Century Film. Falmer: REFRAME Books, 2016. http://reframe.sussex.ac.uk/post-cinema/. Gunning, Tom. “The Cinema of Attraction: Early Film, Its Spectator and the Avant-Garde.” Wide Angle 8.3-4 (1986): 63-70. Nestrick, William. “Coming to Life: Frankenstein and the Nature of Film Narrative.” The Endurance of Frankenstein: Essays on Mary Shelley’s Novel. Eds. George Levine and U.C. Knoepflmacher. Berkeley: University of California Press, 1979. 290-315.